Mark is the VP/GM of Mobile at Genesys. Mark came to Genesys from the SoundBite Communications acquisition where he lead corporate marketing and business development initiatives leading the development of the mobile marketing business unit with acquisitions of SmartReply, 2ergo Americas and Mobile Collect. Prior to SoundBite, he was CEO of Peppercoin, a provider of card-based merchant loyalty programs that was acquired by Chockstone, Inc. (now Heartland Payments) in April 2007. Earlier Mark served jointly as Kenan Systems’ (acquired by Lucent in 1999) Vice President Global Marketing and General Manager of the Internet Business Unit where he played a major role in boosting the company's sales from $20MM to $1.1B. 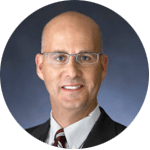 Mark has also served in a number of leadership and go-to-market positions at IBM, Lotus Development, Epoch Systems/EMC and Dragon Systems. Mark holds a dual-degree from the University of Pennsylvania’s Management and Technology program and an MBA from MIT’s Sloan School of Management.